Ah Japanther, the second best band with a Japan-based pun for a name. The group are preparing to deliver their new record, Instant Money Magic, to fans and overtake Japandroids...or are they? The album, out April 15th, is a fine piece of indie rock genre-bending. By 'fine' I mean it okay. There's nothing terribly wrong with it. Unfortunately there's nothing exceptional about it either. The promise of the joyful electro-clash hinted at during the intro to "Wiggmann" is quickly snuffed out, even before that song ends. It seems like we've heard songs like "Common Borne" and "Take Me In and Let Me Go" a thousand times before from a hundred different bands. Despite being the best song title that paraphrases Yoda of 2014, "Do It (Don't Try)" sounds like rehashed Clap Your Hands, Say Yeah! There aren't any truly horrible songs to speak of, although "Song of the Sun" has a robotic handclap that manages to drain all of the warmth out of one surefire indie rock device. The album's standout is "Guns Guns Guns". It's a hazy, under-produced number that ends up sounding like revved up Vaselines. "Onanadoga" gives us some tasty fuzzy indie pop la la la la la's that hit the spot. The most intriguing moments come on "Breb Your Revel" and "Green Jug Intro". The former is a laid back vibe, while the latter has a smattering of Cowboy Junkies' version of "Sweet Jane" to it. 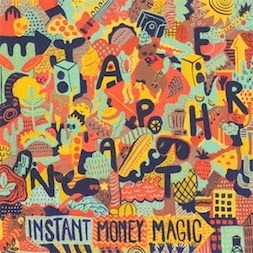 In all, Instant Money Magic suffers from being average. There are so many better records, and there are so many worse records. It's not even worth a listen for the macabre, car-wreck reasons a really bad album is. Best tracks: "Onandoga", "Guns Guns Guns"